Nashville Youth Athletics has provided an arena for the youth (3rd though 8th grades) of the midstate area to pursue cross country and track for the last few years. They are steadily growing their developmental program, with over 700 runners participating in their regional championships (state qualifier) last October. In addition to hosting a 6 meet cross country season, NYA coaches a competitive cross country team. Coaches Brandon and Hollee Ally and Byron Brown work with a group of 40 or so runners from around the Nashville area 10 months of the year. 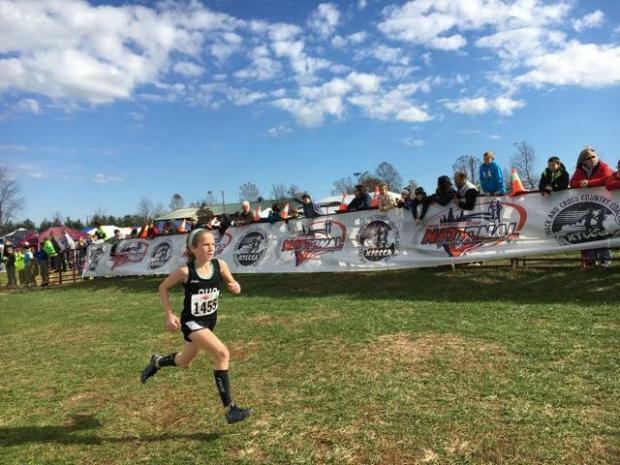 Those athlete shined brightly this past weekend at the Cross Country Coaches National Youth Championships at Masterson Station Park in Lexington, KY! NYA sent a roster of 27 athletes to the National Championships, and 9 of them came back with serious hardware with 6 top 10 finishes! At the top of that list is 10 year old Gabrielle Boulay. Gabrielle has gone undefeated this season, including the KYA Tennessee Elementary School State Meet last October. She set a new state record, blazing the Victor Ashe mile course in 5:35 as a 5th grader. Last weekend, she followed that up winning the National Championship by 8 seconds, covering the 3,000 meter course at Masterson Station Park in 11:59. Teammate Annie Buisson also finished in the top 10 with an 8th place finish in the 9 year old division of that same race, and teammate Mia Andrews was 43rd in the 10 year old division. Following their effort in the 9-10 division, 10 year old Robert Corriea finished 5th with a time of 11:25 on the 3,000 meter course. The 11-12 year old division was just as exciting. NYA's 11-12 boys team has been special all year long. They started the season off winning the middle school division of the Brooks Twilight Classic in Memphis with a meet low of 28 points! Well, this boys team certainly did not disappoint at the youth nationals! The team of Nick Sieders (4th place 12 year old), Miles Ally (9th place 12 year old), Connor Henson (16th place 12 year old), Will Beasley (26th place 12 year old), Jack Gibbs (39th place 12 year old), Baden Brown (54th place 11 year old), John Powers (85th place 12 year old), Lucas Andrews (143rd place 11 year old), and Laim Cullison (146th place 12 year old) finished as National Runner Up with 103 points, losing out to the Brocaw Blazers from Kansas City, MO. Three top 20 finishers at the youth nationals shows the midstate region will be stocked with talent for years to come! The 11-12 girls also competed very well at the front of the race. Hope Ilias ran hard and covered the 3,000 meter course in 11:36 for 3rd place in the 12 year old division! Her teammates Brooktie Frogge was 72nd and Ella Willow was 85th in the 12 year old division. Virginia Hunt finished 82nd on the 11 year old division. At the two ends of the youth spectrum, NYA performed well yet again. The day started off with the youngest NYA participant Lia Banovac finishing 5th in the 8 year old girls division, running the Masterson Station 2,000 meter course in 8:57. The last race of the day featured NYA's 13-14 boys and girls. Ryland McCullough finished 19th in the 14 year old division to lead the boys team of Alex Ponce (29th place 14 year old), Liam Leonard (37th place 13 year old), Will Stacey (57th place 13 year old, Simeon Michelson (91st place 14 year old), and WIlson Berry (97th place 14 year old) to a 12th place finish. The 13-14 girls of Helen McCall (40th place 14 year old), Eden Mittelsdorf (65th 13 year old), and Olivia Moody (82nd place 13 year old) ran very tough on the hilly 4,000 meter course. NYA now heads to the Footlocker South Championships in Charlotte, NC this Saturday. I know they will represent the state of Tennessee very well! NYA will take a break and hit the ground running again in January. Their competitive team will begin meet action at the Vanderbilt High School Indoor Invitational (a meet that NYA actually helps to host).